Kitchen sponges are a typical sight in most homes today. These handy sponges are a must-have in the kitchen and dining room after meals, as you can’t wash the dishes and utensils clean without one. Though all kitchen sponges are made to clean, they are made in different sizes, shapes, and materials, all of which will give different results while cleaning. Deciding on what sort of kitchen sponge to buy will depend on what your needs are in the kitchen sink. We’ll help you decide by giving you a list of things to consider when buying a kitchen sponge, as well as a list of the top ten best kitchen sponges available online today. Let’s get scrubbing! All kitchen sponges are called “kitchen sponges”, but not all kitchen sponges are the same. With so many kinds of kitchen sponges available, it seems difficult to decide which one is the most balanced one for you to use. Here, we will give you pointers on which kitchen sponge to choose! There are different materials used to make different kinds of kitchen sponges. Each kind of material has its own uses and effects. Which one will you need the most? Cellulose sponges are the cheapest, most popular and most easily available kind of kitchen sponge. They are very absorbent, meaning that they soak up a lot of water, which is good for when you’re washing tableware and utensils at the sink. Because they are so soft and absorbent, cellulose sponges are good for washing off food stains from plates and utensils easily. They’re also good for wiping water from wet surfaces. However, since cellulose sponges are so absorbent, they can end up absorbing food particles and dirt, which will be very hard to clean out and can wear out the sponge quickly. Lots of bacteria can also grow on and stick to these kinds of sponges. 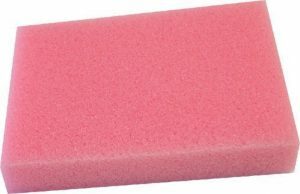 These kinds of sponges are made with polyurethane foam, the same kind found in foam mattresses. 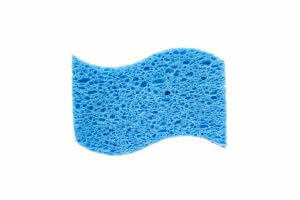 Foam sponges are light and springy, and for the most part they can retain their shape for a long time. 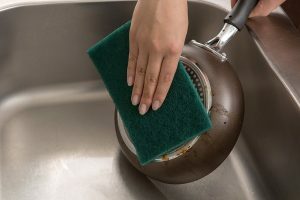 Their spongy holes are much smaller than that of cellulose sponges, and they are not as absorbent, but they can absorb a good deal of liquid soap so cleaning tableware with them isn’t a hassle. Fewer bacteria grows on these sponges as well. While foam sponges tend to last longer than cellulose sponges, they aren’t easy to dispose of when they wear out due to the polyurethane. There are two kinds of abrasive kitchen sponges: The first kind is the same as cellulose or foam sponges, except that there’s a layer of tough material, such as plastic, on one side of it. 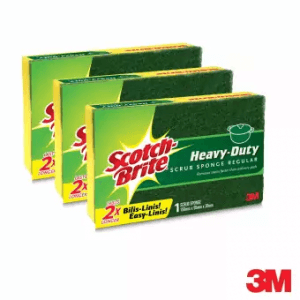 The second kind is a sponge or even a scrubbing pad made entirely of abrasive material. Abrasive kitchen sponges are good for removing stubborn food particles from things like barbecue grills and metallic pots and pans. These kinds of sponges don’t absorb much water and they dry quickly and easily, making it less likely to get contaminated with bacteria. However, the tough materials of these sponges can end up leaving scratches on the surfaces of your tableware and cookware. These are especially not recommended for non-stick pots and pans, as the sponges could end up chipping off the non-stick Teflon material coating the pans. For extremely difficult stains! 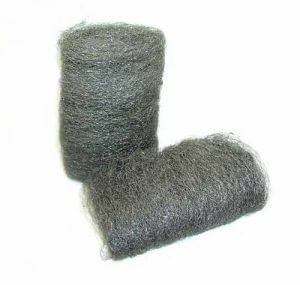 Steel wool sponges are made out of fine strands of steel woven together. Since they’re made of steel, they’re used to clean things like burn marks and even rust off of pots and pans. Like the abrasive sponges, however, steel wool sponges can cause scratches on the surface of tableware and cookware. There are steel wool sponges that are softer, and therefore can be used for cleaning glassware, but it’s still recommended to be careful with these. As the name suggests, nylon sponges are made out of nylon fibers woven together. They’re tougher than cellulose and foam sponges, and can’t absorb water very easily (though they can still absorb liquid dish soap); but they’re softer than abrasive sponges and steel wool sponges. These make nylon sponges ideal for cleaning out stubborn food particles on cookware and tableware without leaving any scratches. Feel free to use these kinds of sponges when cleaning non-stick pots and pans, glass and ceramic tableware. That being said, some food particles can get stuck to the nylon sponge’s woven nylon fibers, so make sure to rinse off these particles thoroughly after cleaning. Silicone sponges look the least like traditional kitchen sponges, but they are very versatile when it comes to cleaning! As the name suggests, silicone sponges are made out of silicone bristles bunched up together, usually cut in a shape. 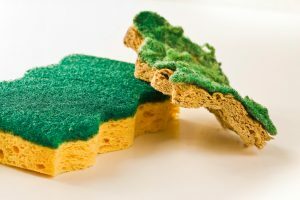 This kind of sponge is not absorbent at all due to the material it’s made of, but because of this, it doesn’t absorb food particles and dirt into it, making it so much easier to clean and reuse for a long time. That also means that bacteria won’t grow on it, especially if it’s disinfected very well. Silicone sponges are also soft and bendable, which makes it ideal to clean corners and smaller tableware. That being said, soap doesn’t stick very well to silicone sponges, and when washing they can become slippery and therefore hard to use. We’re all familiar with the ordinary square-shaped kitchen sponge, and while that sort of sponge does its job well, some people want to have a little more fun while washing their dishes and utensils. Some kitchen sponges come in a variety of different colors. And some kitchen sponges come in fun shapes as well. Silicone sponges especially can come in a wide variety of shapes, from circles to stars. But some cellulose, foam and abrasive sponges come in fun designs as well! Another thing to consider when buying a kitchen sponge is how long you will be able to use it. Some sponges, especially softer ones like some cellulose sponges, wear out after a month or even after a few weeks. It’s recommended that once your kitchen sponge becomes dirty, tattered and bad-smelling, you should throw it away and replace it with a new sponge. When buying a new sponge, think about how long you want it to last before getting a replacement for it. Usually, the more durable the sponge is, the longer it can be used for cleaning. You should also consider things like the cleanliness of the sponge after use, sterilization methods for your sponge, the cost of a replacement once your sponge wears out, etc. Buying kitchen sponges in a set or in bulk could be helpful so you wouldn’t need to worry about looking for replacements for a while. Now that you know the different kinds of kitchen sponges, it’s time for us to share with you our top 10 choices for the best kitchen sponges available. We hope you can find one here that will help make your dishwashing a lot easier! There’s more to this kitchen sponge than cute packaging with a silly face! 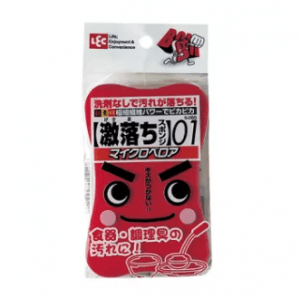 Coming from Japan, this sponge is made of micro velour, which cleans any dirt without soap. Just put it to your dirty dishes, add a bit of water, and your dishes will be as good as new. You’ll still need to wash the sponge itself after use though, but thankfully that’s easy. You might want to pass this sponge over if you feel better using soap for cleaning, but if you’re okay with the idea of a water-only wash, why not check it out for yourself? 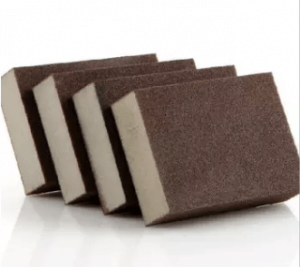 These cellulose sponges come with a thick layer of abrasive material on one side. This particular sponge specializes in removing tough-to-remove stains from your tableware. One of the best things about this product is that it lasts twice as long as most other kitchen sponges on the market. Also, you could get a bundle of 6 kitchen sponges in one go. You wouldn’t have to worry about finding a replacement once the first sponge has worn out. If you have a lot of tableware with stubborn dirt to wash every day, these sponges will be a great help for you. These adorable brushes are made of soft and porous cellulose, with a nylon abrasive on one side that allows you to clean non-stick Teflon cookware. With a simple but stylish and fluffy cloud shape, it can wash away the dirt off your plates without a fuss. 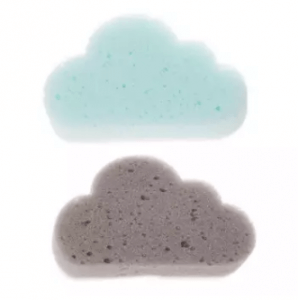 Coming in blue and gray colors, these sponges are the farthest thing from gloomy. 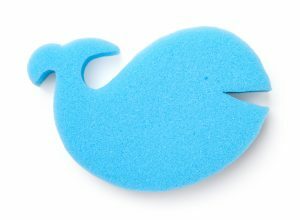 They are best for people who want a soft, gentle sponge for cleaning but also want to be cute and have a little fun while washing the dishes! Made with two thick layers of foam sponge with a third layer of nylon, these fun-shaped kitchen sponges are light but durable and great for everyday use. The dolphin shapes, of course, are adorable and charming! They’re sure to make you smile with every wash. 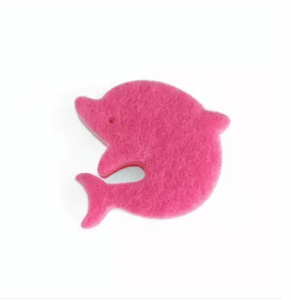 If you want the benefits of both foam and nylon sponges with a special side of cuteness and fun, these dolphin buddies could be your perfect match. If you regularly deal with food stains and particles sticking to your cookware, especially the bigger pots and pans, this scrub pad might be the one for you. The pad is made of hard and tough abrasive material and is recommended for stainless steel pots and pans. You can also use it to clean the sink and the stove. 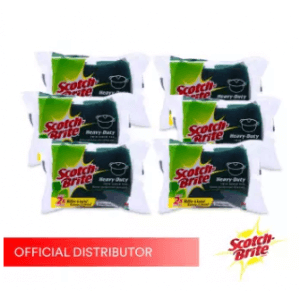 Similar to the previously-mentioned M3 Scotch-Bright product (#8), this scrub pad also lasts twice as long as other kitchen sponges of the same type, so you can use it on your pots and pans for a long while. If there are dark, gross stains left over from food or fire on your cookware, this might be the solution! This sponge is a foam sponge wrapped with a sheet of Carborundum, which feels like sandpaper. With its gritty, rough texture, this Carborundum sponge could help you remove those dark stains on your stainless steel or brushed cookware and tableware. You could get 5 Carborundum sponges bundled together, in case all that tableware and cookware needs a lot of regular scrubbing. These cute circular sponges have soft and small bristles on both sides that are ideal for collecting and scrubbing out the dirt and grime on your used plates. The whole sponge is just as soft, making it bendable and perfect for cleaning bigger and smaller tableware and cookware alike. Being made of silicone, food particles, dirt and grease are easily washed away. You can easily disinfect it with hot water, too. For lower risk of bacterial infection, these are the ideal kitchen sponges to use. 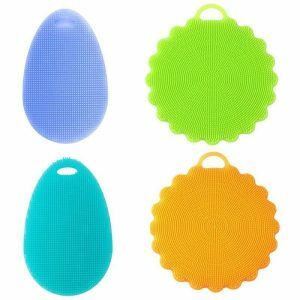 These silicone sponges are similar to #2, but there is one noticeable difference: they come in two different, fun shapes. The oval silicone sponge, with its egg-like shape and soft, bendable material, can be used for cleaning smaller tableware, glasses, and bowls. Like the previous silicone sponges, they are easy to clean out and dry and disinfect. They are also heat-insulated, so you can use it to hold hot objects like pot handles and bowls of hot food. Those who want sanitary and multipurpose kitchen helpers could benefit from these silicone sponges. Each kind of kitchen sponge has its own special uses and purposes depending on what it’s made of, what they look like, and how long they’ll last. The kind of sponge that will work for you depends on what kinds of tableware, cookware, etc. you have at home, so take what your kitchen needs into consideration. We hope that our tips and recommendations were helpful to you!